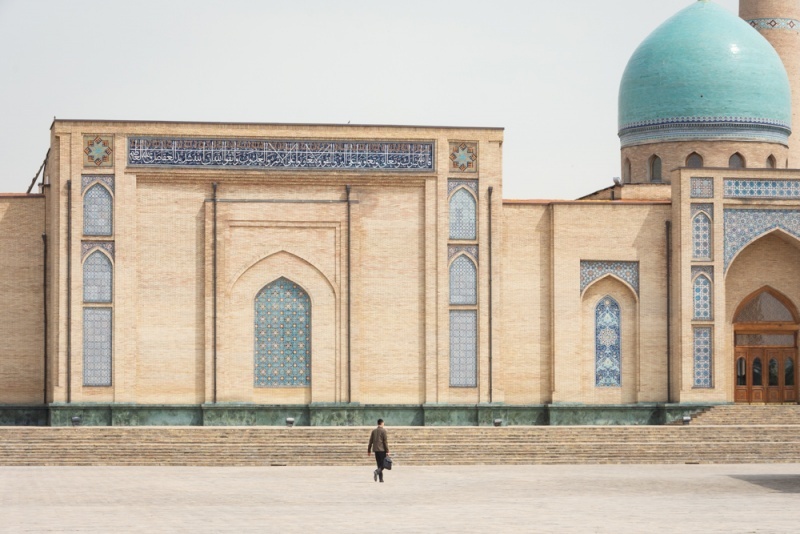 Tashkent is the capital of Uzbekistan and where you’ll likely begin and end your trip. 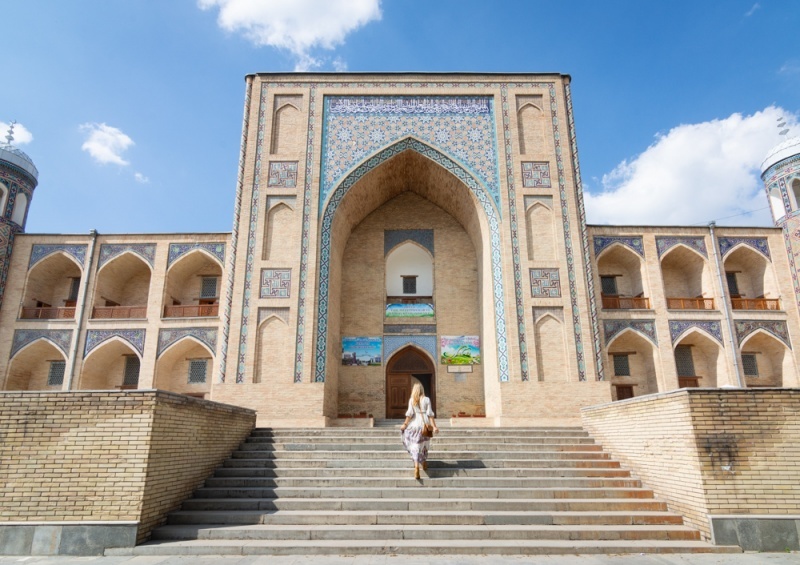 It’s home to the country’s international airport so most people fly into Tashkent and spend less than 24 hours in the city before heading west to Samarkand. But Tashkent has its own charm and it’s worth spending a few days here to experience what life is like outside of the touristy towns. Instead of just passing through, we’d recommend spending at least a few days in Tashkent as it actually has a lot to offer! There are loads of delicious restaurants, the historical sites are beautiful, and the people are so friendly. 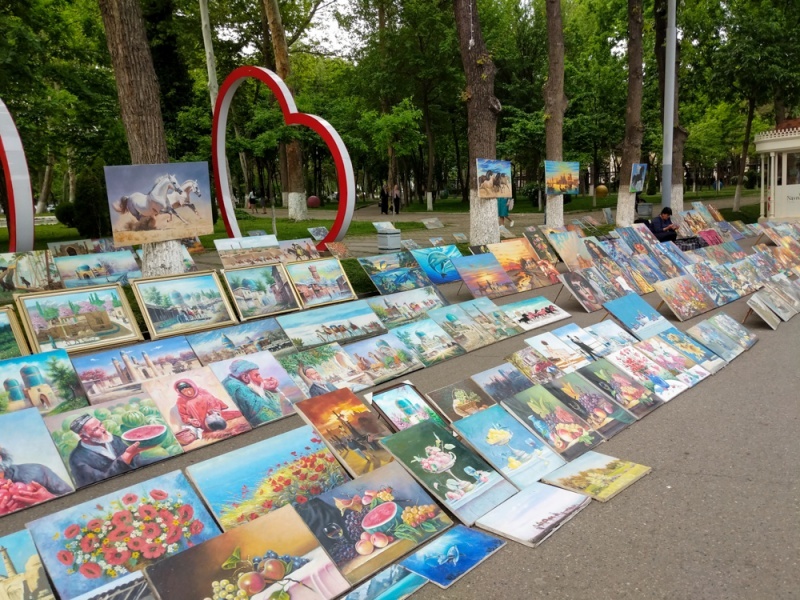 Check out our 13 favorite things to do in Tashkent below! The currency of Uzbekistan is the Uzbekistani Soʻm (UZS). At the time of writing, the conversion was 8,450 UZS to $1 USD. 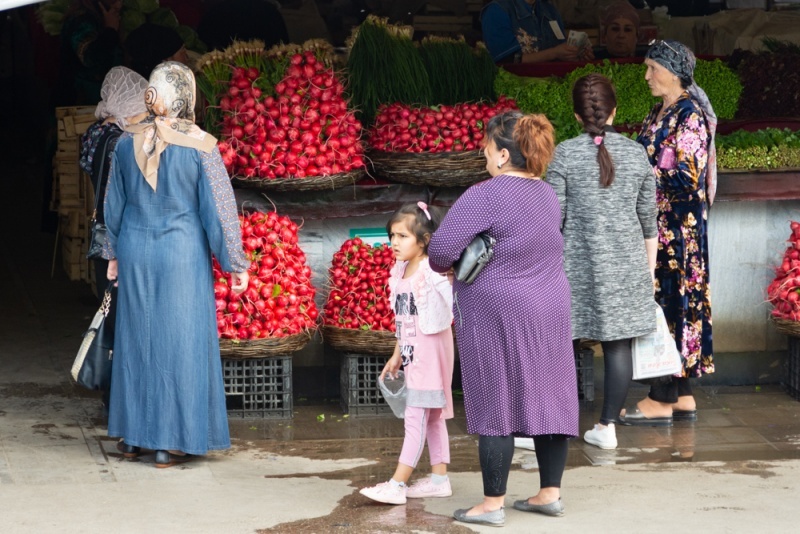 In this post we’ll be referring to prices in Uzbekistan currency. Bring some cash with you to exchange at the airport. There are only 3 ATMs at the airport in Tashkent and they are often out of order. You can exchange money at the small window right outside of immigration at a decent exchange rate. It’s not nearly as conservative as you might think. You’d probably feel a bit out of place in daisy dukes and a tube top, but pretty much anything else goes. Just cover yourself when you visit any religious sites. Tipping is not common, in fact, most taxi drivers actually round down. So if your ride should cost 8,300 UZS and you give them a 10,000, you’ll likely get 2,000 back. Islam Karimov Tashkent International Airport is located in Tashkent and you’ll likely need to fly into and out of it. There aren’t many airline options to get into and out of the country other than Uzbekistan Airways. Taxis are incredibly cheap in Tashkent. You should only pay 1,000 UZS per kilometer so most trips will be less than a dollar. The only difficulty is that many taxi drivers don’t speak any English so getting them to understand where you need to go can be a challenge. Download the Yandex.Taxi app (iPhone | Android) so you can easily input your destination. The metro will also get you where you need to go for next to nothing (1,000 UZS per trip) but be aware that none of the signs are in English. And none of the announcements are in English either. So unless you’ve really researched your stops, you’ll have a challenging time figuring out where you need to go. 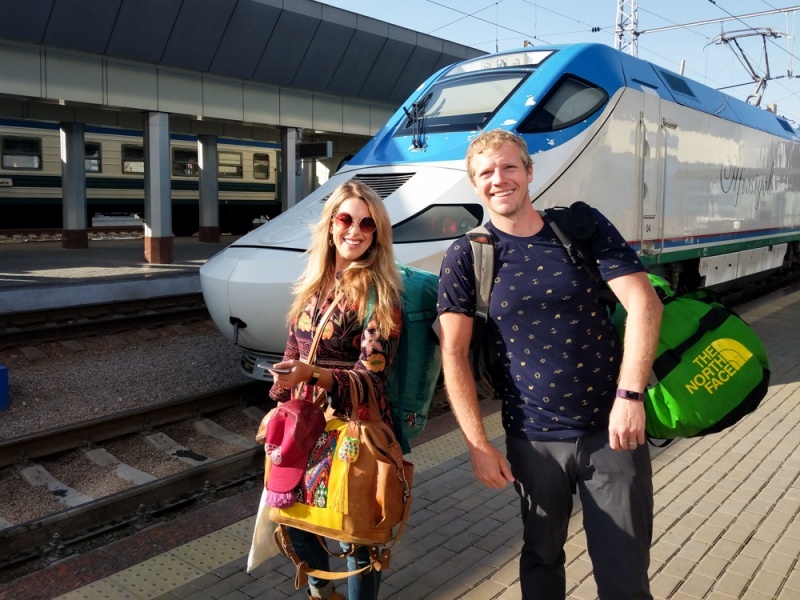 Trains in Uzbekistan are fast, convenient, and comfortable. The train from Tashkent to Samarkand takes less than 3 hours and the most you will pay is 105,000 UZS for the fast train. The slower train, which takes closer to 3 hours, will save you about 35,00 UZS. You can book your train tickets online although the train station names are in the Uzbek language which can be confusing. Plus they’ll add a processing fee to the price of your ticket. You can also buy directly in the train station if you want to avoid the additional cost. Finding a hotel in Tashkent can be difficult as most of them are old and dated. By far the nicest accommodation around is the Hyatt Regency Tashkent. Offering gorgeous rooms, an indoor swimming pool, and a revolving restaurant, you’ll never want to leave your hotel! 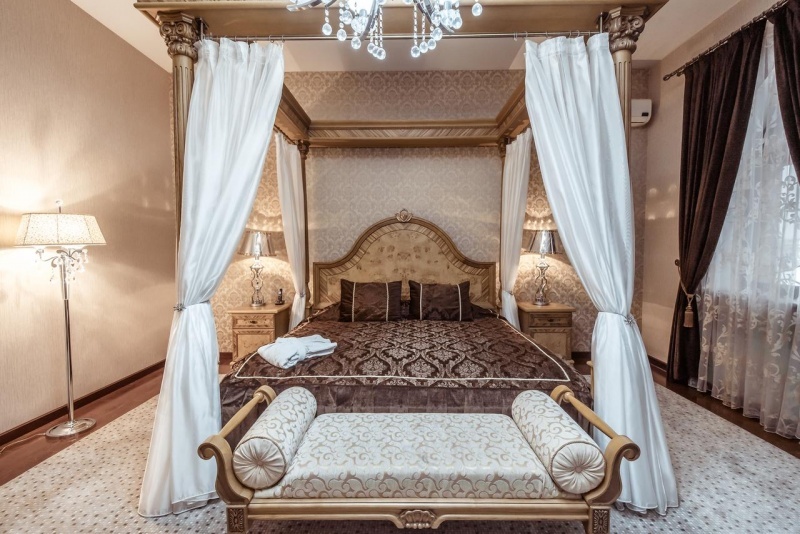 The impeccably decorated rooms at the Ichan Qal’a Premium Class Hotel are fit for a king! Plus they are super spacious and comfortable. You’ll love the well-equipped fitness center and the refreshing pool. It’s certainly one of the nicest hotels in the city! The location is just outside of the center but it shouldn’t matter since taxis are so cheap! 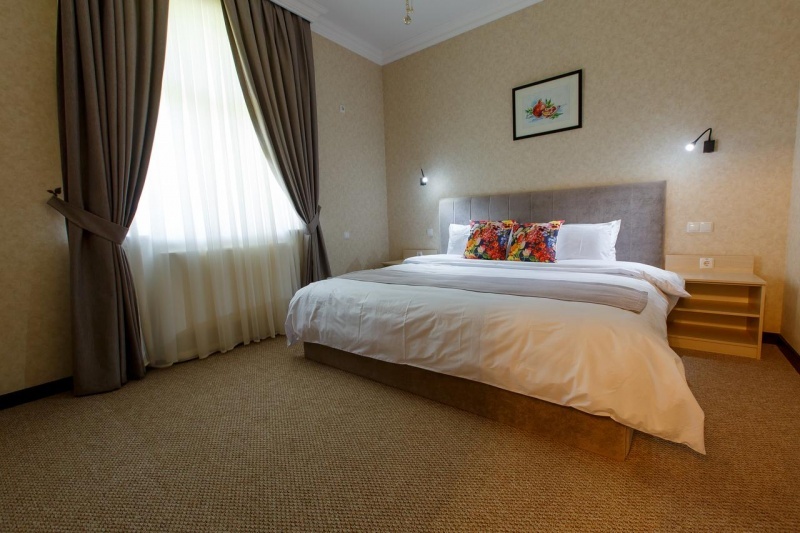 If you are looking for something more mid-range, then Navruz Hotel is a great choice! 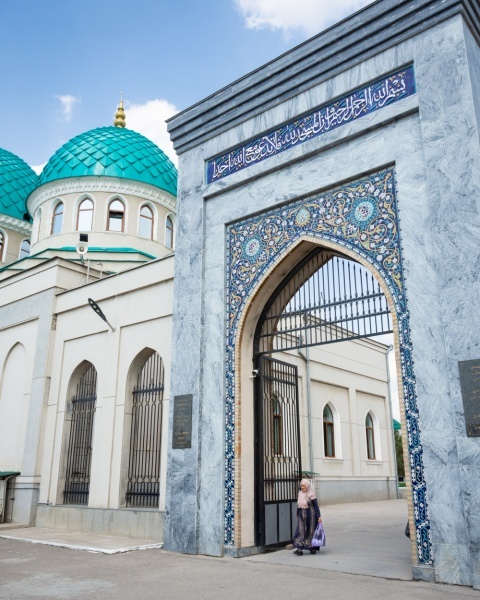 It’s close to the Tashkent Tower and Minor Mosque, as well as a metro stop to get you anywhere you need to go in the city. Rooms are spacious, clean, and comfortable with updated, modern decor. Kafe-Restoran Ogni Tashkenta is a darling little restaurant with delicious salads, yummy desserts, and the most delicious mulled red wine. Service here is stellar, you’ll think you’re dining at a super fancy restaurant but prices are actually quite reasonable. BookCafe is a quaint, peaceful little coffee shop with comfortable seating areas and fast Wifi. It’s a great place to go if you want to enjoy a cup of coffee while getting some work done. They also have a full food menu but beware, it’s written in Uzbek. You can use Google Translate to try to navigate their offerings or just do as we did and order the chicken club sandwich (it’s delicious). Qorasaroy is a very local restaurant just a block north of the Hazrati Imam Complex. 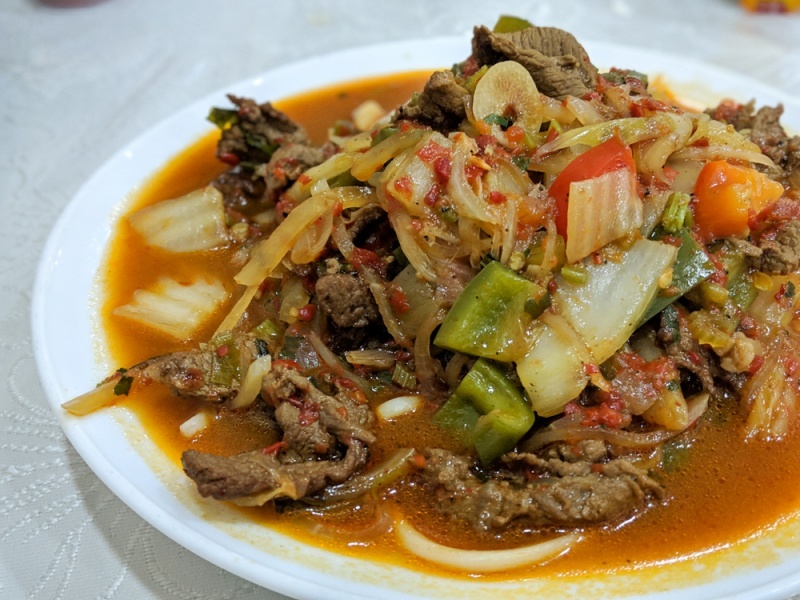 Their signature dish, “lag’mon” is one you must try during your trip to Uzbekistan. It is made of noodles, veggies, meat, and a sauce that tastes eerily similar to pizza. Beware that the menu is written in Uzbek so just order the lag’mon, bread, and lemon tea. Your bill will be less than 50,000 UZS for two people. Silk96 WineLounge is a chic bar with a large imported wine list. If you have a hankering for a good bottle of wine, this is the place to go. But because it’s all imported, it’s also pretty pricey. If you’re trying to stick to a budget, opt for the mulled wine instead. They also have reasonably priced (and delicious) food and cocktails. Caravan is a restaurant and bar that serves Georgian food and often has nightly live music. Beer and wine are reasonably priced and it has a nice, local vibe. The food is good but if you’re short on time we’d recommend just enjoying a few drinks here while listening to live music and enjoying dinner at one of the spots we recommend above. 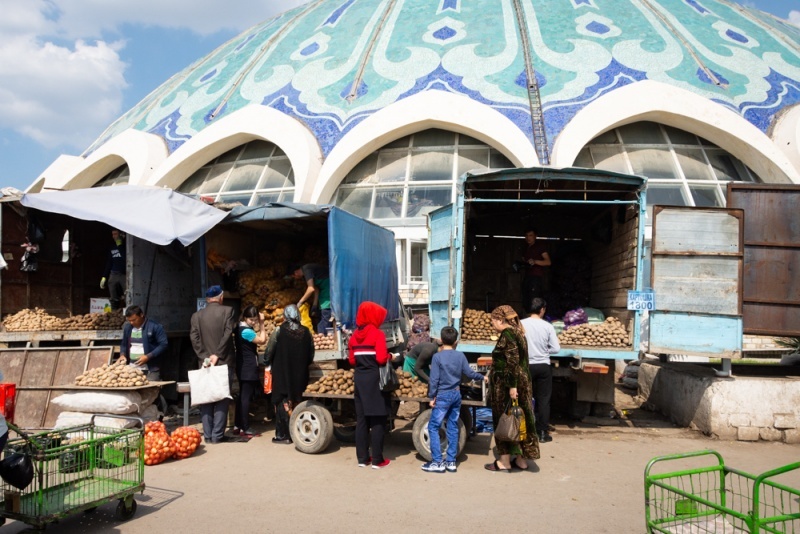 The Chorsu Bazaar is a great place to experience the local flavor of Tashkent! The covered area of the bazaar, under the massive blue dome, is full of vendors selling various raw food products. Behind the central dome, you’ll find a huge tented market full of fresh fruit, veggies, honey, and spices. Continue on toward Ko’kaldosh Madrasasi and you’ll pass little stalls selling clothing, fresh bread, jewelry, beauty products, and more. This isn’t a tourist market, it’s mostly locals here. There are a few shops that have souvenir-type products, but you’re better off saving your treasure shopping for Bukhara or Samarkand. This is just a great place to do some people-watching in Tashkent. The Kukeldash Madrasah (Ko’Kaldosh Madrasasi) and the Dzhuma Mosque are right outside of the Chorsu Bazaar. Both are beautiful examples of Islamic architecture and are certainly worth a stop when you’re in the area. You’ll have to pay a small fee to enter the courtyard of the madrasah, 10,000 UZS per person. Inside is a small shop with intricate wood carvings and if you’re lucky you can see several wood carvers hard at work. The Tashkent Tower is the 11th tallest tower in the world. The building has an interesting shape, almost like a spacecraft that is getting ready to launch. The entire structure stands 1,230 feet high and the observation deck is 328 feet above the ground. You’ll get off the elevator on the 6th floor for the observation deck, or you can continue to the 7th floor to have a beer in the revolving restaurant. The decor is really funky and the food and drinks are surprisingly reasonably priced. 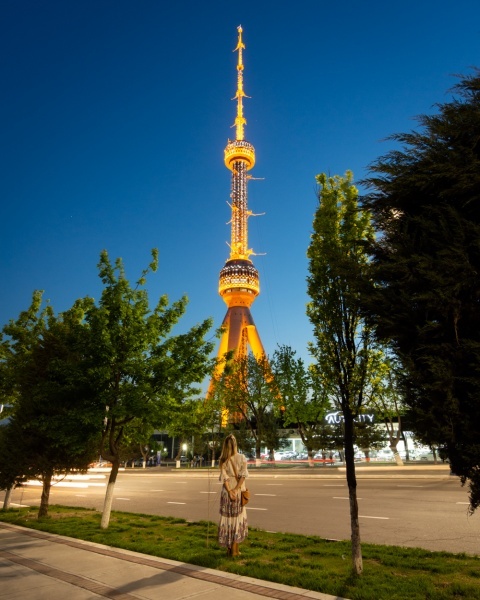 If you’re in the area, head back to the Tashkent Tower after dark. It comes alive with blinking white lights after the sun goes down. It’s a must-see during your trip to Tashkent! Entrance Fees: 40,000 UZS per person. You’ll need your passport to enter the tower, don’t forget! 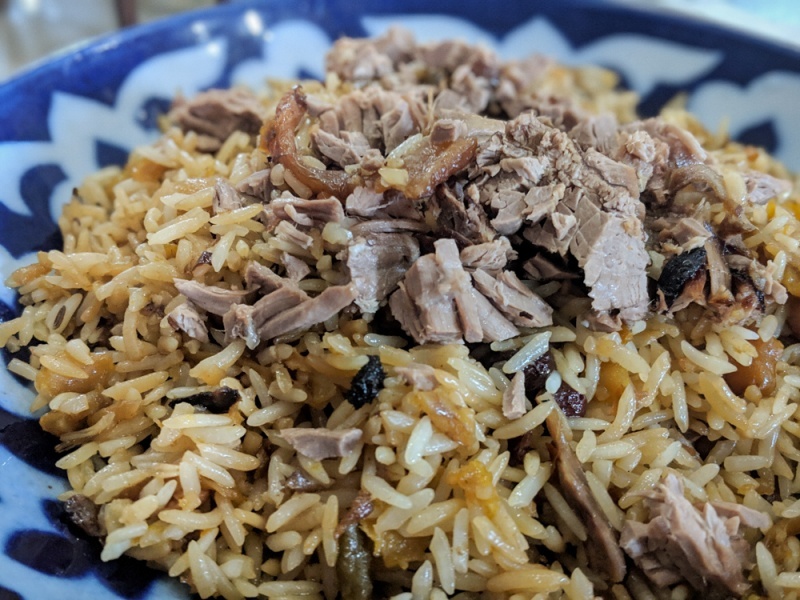 Plov is the traditional cuisine of Uzbekistan and a must-try during your visit! This dish is comprised of rice, onion, carrots, and meat (usually lamb or beef), cooked in a large cast-iron pan. 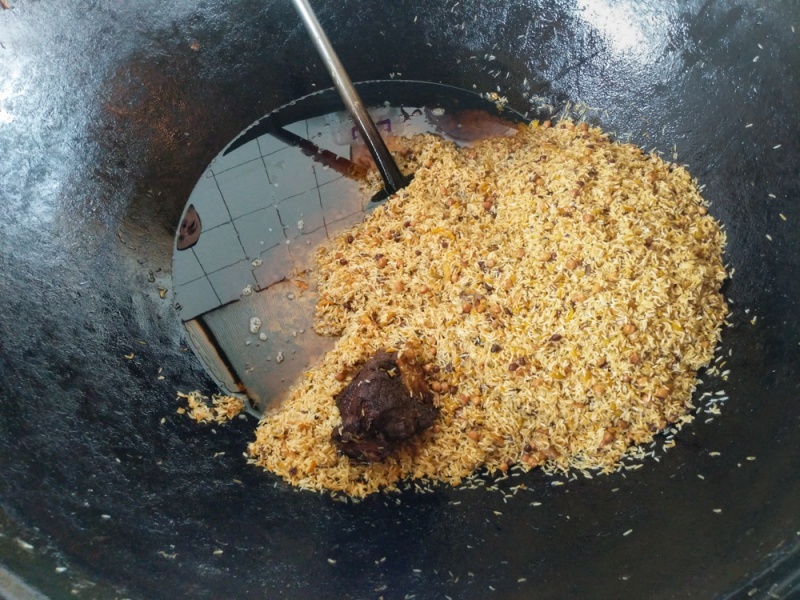 It’s a bit like fried rice but without the egg. Plov is a heavy dish so plan to take it easy after eating a massive bowl of this yummy dish. You can find restaurants serving plov all over Tashkent but the most popular one is Central Asian Plov Center. Here you can get freshly baked bread with dip, pickled veggies, lemon tea, and two big bowls of plov, all for under $5 USD. But keep in mind that it’s more of a lunch spot and they close at 6:00pm. You’ve got to try it at least once during your trip to Uzbekistan! The memorial to the Victims of Repression is a large gazebo-shaped structure topped with a bright blue dome. It’s easy to see from the Tashkent Tower observation deck. The park surrounding it is gorgeous and is quite popular for wedding photos. The Museum of Victims of Repressions is right next door and is worth wandering around to see the intricately carved wooden details. There is also a nice view of the Tashkent Tower all lit up at night from the park. 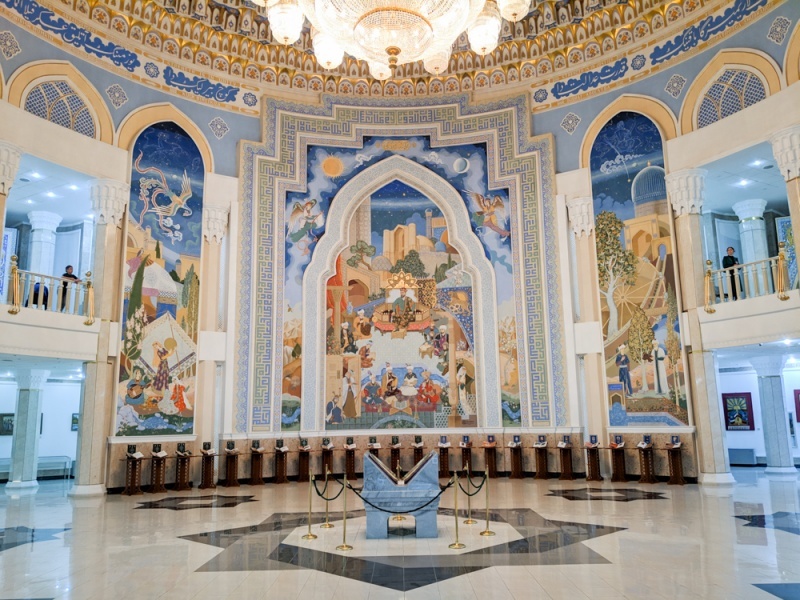 The Minor Mosque is the most spectacular mosque in the city of Tashkent. It is stark white with a large blue dome and intricately carved wooden doors. The gardens in the front are perfectly manicured, as are the trees in the inner courtyard. Women can enter the mosque if their shoulders, knees, and head are covered and men have a separate entrance on the right side of the courtyard. You’ll be in awe of how incredibly beautiful this mosque is, inside and out. 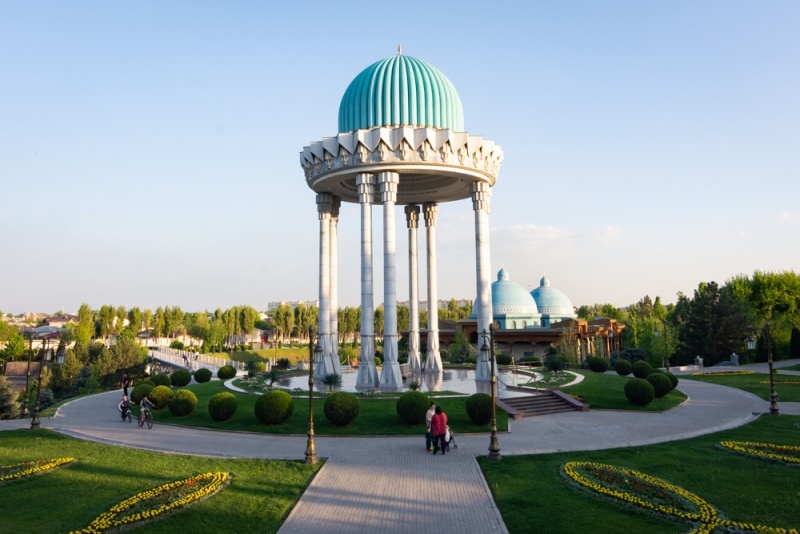 It’s arguably the most popular attraction in Tashkent and you’ve got to see it in person! The Hazrat Imam Complex is a small area where several mosques and madrasas are in close proximity. Plus there is a huge mosque currently being built right next door. It’s awesome to stroll around this complex, admiring the architecture of these beautiful structures. The Barakhan Madrasah is the most impressive building in the complex. 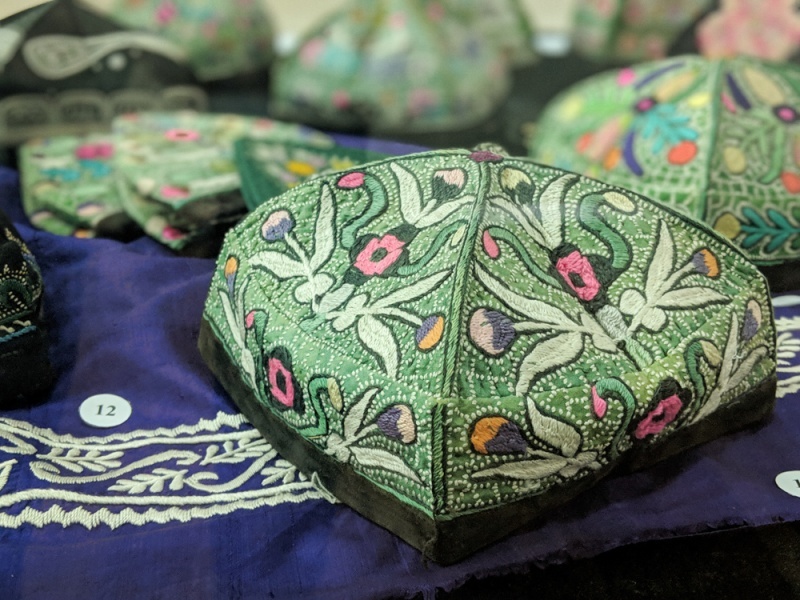 Anyone can enter the inner courtyard (no head covering required) and the classrooms have been transformed into small shops selling traditional Uzbekistan souvenirs. Don’t miss it during your stay in Tashkent! Amir Temur (sometimes spelled “Timur”) has been officially recognized as Uzbekistan’s national hero due to his conquering of Western, South, and Central Asia during the 14th century. You’ll see his name all over Tashkent including the Amir Temur Monument and Square. Temur is a controversial figure as he sacked and destroyed many cities during his reign. But for Uzbekistan, he is a unifying figure of strength and courage. In fact, his name and image has replaced the previous landmarks bearing the names of Marx and Lenin. 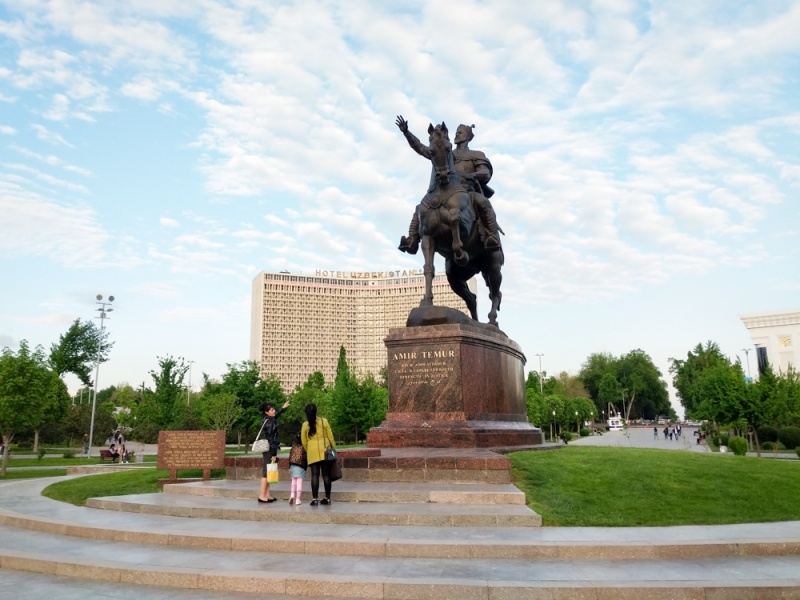 The Amir Temur Square is a nice place for an afternoon stroll. It’s peaceful and beautiful and really popular with Uzbekistan families. The large monument of him on a horse is at the center of the park. As mentioned above, Amir Temur is a hero in Uzbekistan and you’ll see his name everywhere. The Amir Temur Museum houses a few depictions of his likeness as well as some of his belongings. The most impressive area of the museum is the central rotunda. A copy of the quran sits in the center with a vibrantly colored mural behind it. The domed ceiling is painted gold with a fantastic chandelier hanging from the center. The rest of the museum houses small-scale models of the most important mosques around Uzbekistan, as well as copies of important cultural artifacts. You won’t need more than 30 minutes here to see all of the highlights. Entrance Fees: 16,000 UZS per person. 30,000 UZS to shoot photos and 40,000 UZS for video. Hours: Open Tuesday through Sunday from 9:00am until 5:00pm. Closed Mondays. 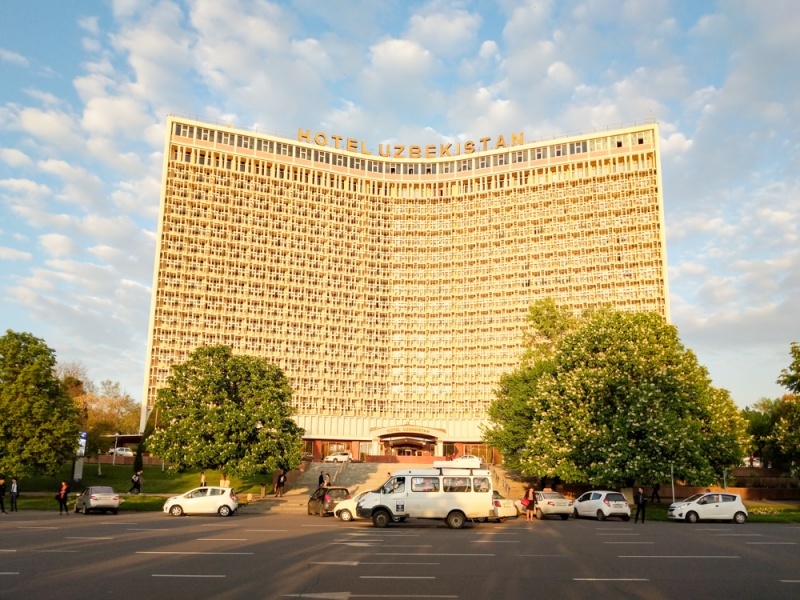 Tashkent is full of post-Soviet era architectural remnants and the Hotel Uzbekistan is one of the best examples. It’s a large, cream colored concrete building with patterned slabs over the windows. It’s impossible to miss while you’re wandering around the Amir Temur Square as it towers over the eastern edge. Don’t bother going inside the hotel, the interior isn’t nearly as interesting as the exterior. 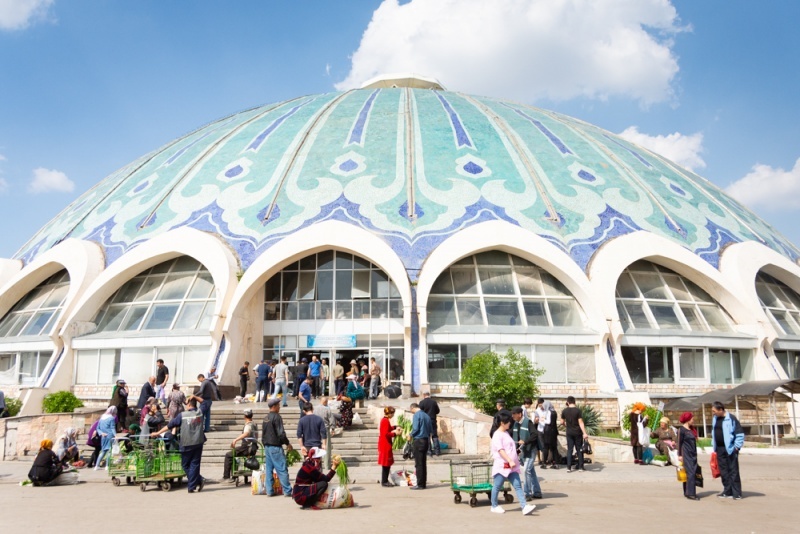 Be on the lookout for other post-Soviet architecture during your stay in Tashkent. You’ll find similar buildings all over the city. Sailgokh Street lines the park just to the west of the Amir Temur Monument and is quite a popular spot in the early evenings. Vendors selling antiques and unique paintings line the pedestrian street as do artists vying to sketch your portrait. Local entrepreneurs have games for kids (and adults!) to enjoy and motorized cars are available to rent for small children. 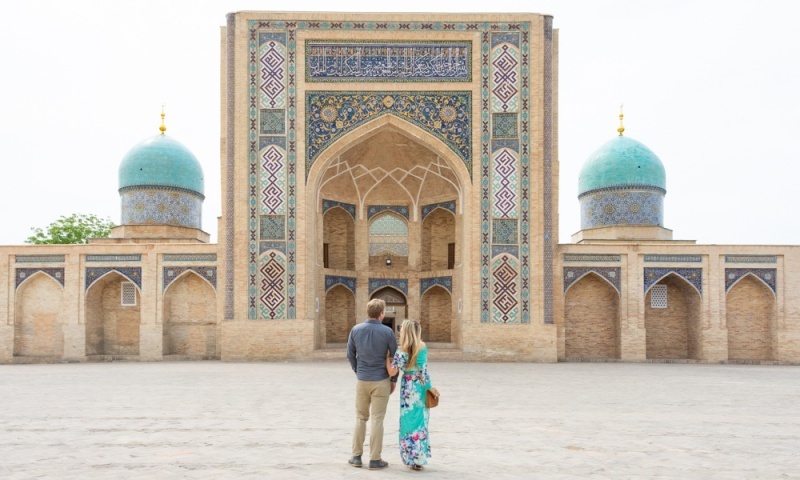 It’s the perfect place to find unique Uzbekistan treasures or just enjoy watching the locals enjoy time with their families. Don’t be surprised if you get approached by young people who want to practice speaking English or take a selfie. Taxis are so cheap and easy in Tashkent that we would recommend using them as your primary means of transportation. However, it’s worth taking the metro to see the impressive and unique stations. Every one of them is different. When you enter the metro station you’ll need to buy a small plastic token from the window, it’s 1,000 UZS per person. Then you’ll have your bag inspected and head down the steps to the trains. 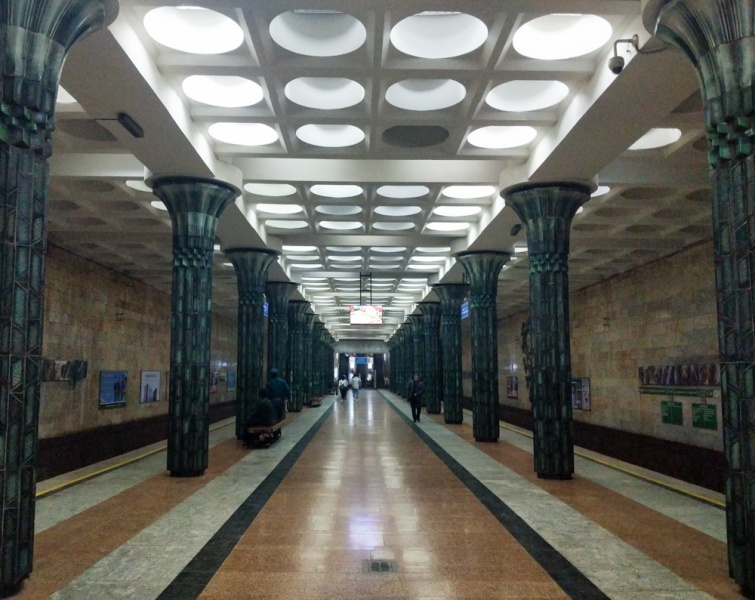 The stations have different features – some have gorgeous light fixtures, others have ceramic artwork on the walls, and still others have impressive archways. They are old and you’ll feel like you’re in a museum or a ballroom, somewhere much fancier than a metro station. Keep in mind that the metro is difficult to use as none of the signs are in English. Check the Uzbek names of the stations that you need to get off at and don’t be nervous about asking someone, most people will be happy to help you get where you need to go! The State Museum of Arts is a well-organized museum with a wonderful collection of Uzbekistan artifacts. The second floor is the highlight of the museum, with intricate wood carvings and beautiful handwoven tapestries. It’s definitely worth a stop while you’re in Tashkent, even if it’s a short visit, as the entrance fee is only about $1 USD. We found it to be the most interesting of the museums that we visited in Tashkent and would recommend checking it out! Enjoy your time in Tashkent! 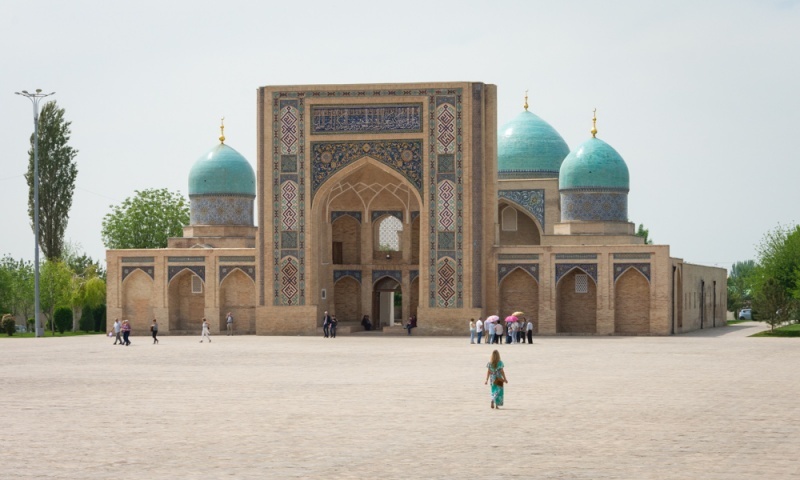 Want more info to help you plan your trip to Uzbekistan? Check out our favorite travel guides!